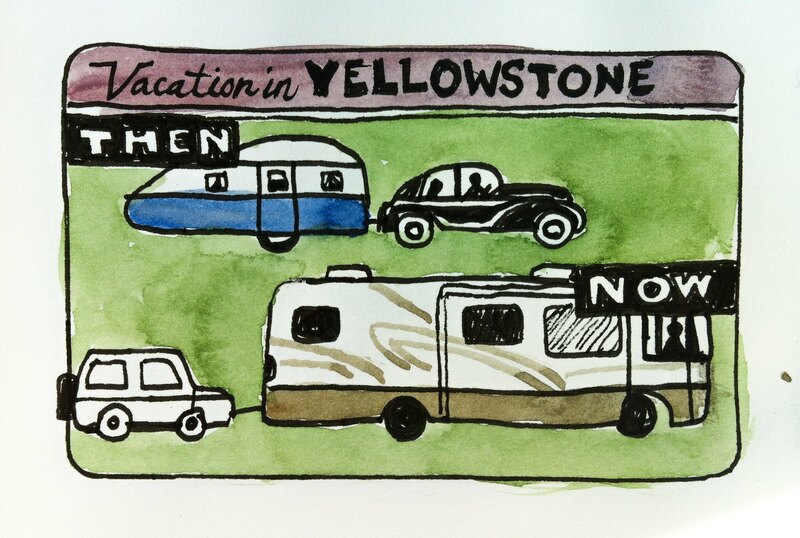 In June 2014, Jeff and I took a 17-day road trip through the Northwestern U.S. in our VW Westfalia camper van. We both drove, but whenever it was Jeff’s turn, I sat next to him in the passenger seat and sketched the landscape as we zipped through it (if you can call it zipping in an older VW van). 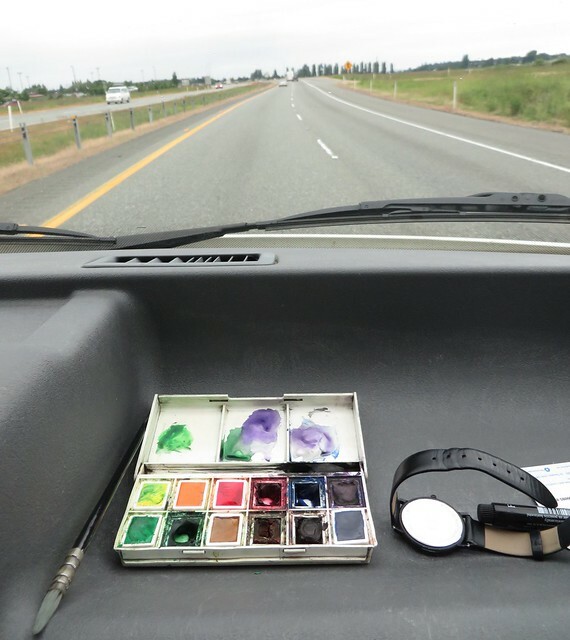 The seats in the van are upright and comfortable, you’re towering over normal-sized passenger vehicles, and there’s a large tray-like dashboard area with a deep rim that comfortably holds a travel watercolour kit and pens. 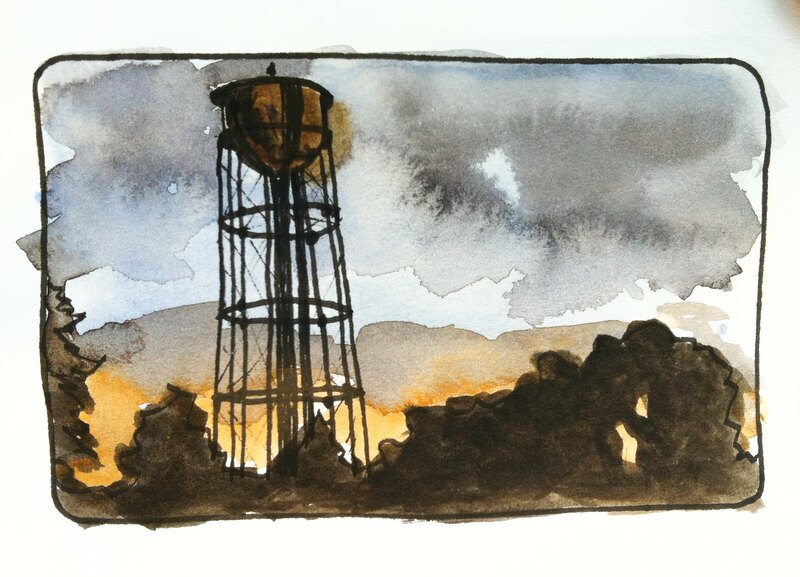 A letter-size sketchbook was on my lap and a jar of water for my brush in the drink holder of the passenger door. The perfect setup. My challenge was to sketch as quickly as possible. So I prepared small frames in the sketchbook by tracing a credit card 8 times on each 8.5 x 11 page. I’d prep several of those 8-frame pages at a time, and then fill each one within 1 to 5 minutes (some were done in 10 or 15 minutes, when we weren’t driving). 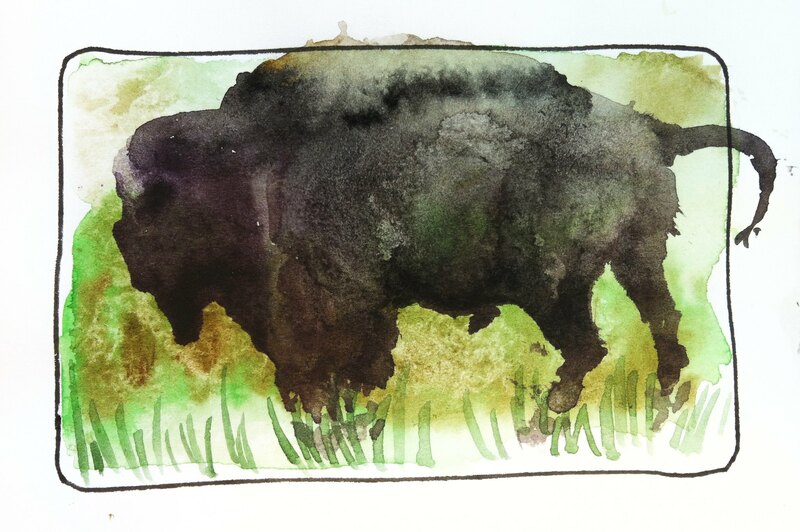 The speed with which I had to draw, forced me to quickly assess a view and not linger over details. Some views passed by so quickly that I had to make stuff up after seeing them, relying on my bad memory. Most of the sketches took only 1–5 minutes. But it was great fun and I observed much more intently this way than if I’d been idly staring out the window for hours. It got to the point where I didn’t want to drive anymore because I had so much fun sketching. And normally I enjoy driving. But Jeff made sure I drove my share. I have created a 5-minute video of our road trip in sketches. Enjoy the ride!